Updated: 5 Ramadan 1433H / 24th July 2012M, Ra. Assalamualaikum. 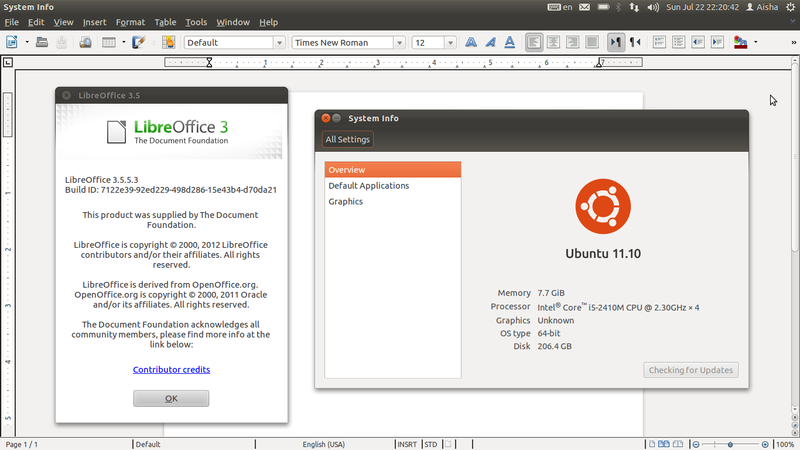 This time i have upgraded from LibreOffice 3.4.4 to LibreOffice 3.5.5 while still running Ubuntu 11.10 Oneiric Ocelot. See Pic 1. 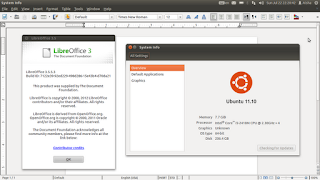 Pic 1 - Screenshot of LibreOffice Writer 3.5.5 on Ubuntu 11.10 Oneiric Ocelot. The reason to upgrade is, i'm trying to solve a problem with the borders of a figure in Writer (sometimes i draw in Writer instead of Draw, it's an old habit). The borders of other figures created previously turned out OK. Recent figures were problematic. 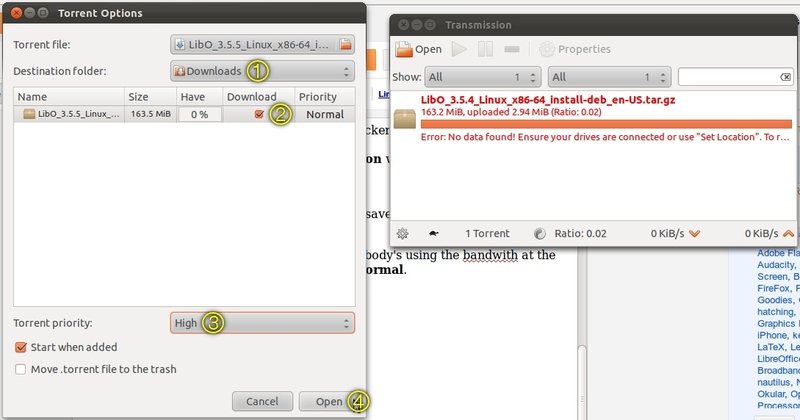 So my hunch is, the source of the problem is with the version of LibreOffice. 1. Run the Synaptic Package Manager. The Authenticate window, see Pic 2, will appear before the Synaptic Package Manager window appears. Key-in your password in the Password field then click the Authenticate button. Pic 2 - Refer to Step 1. The Authenticate window. Pic 3 - Refer to Step 2 and Step 3. The search result for the search term "libreoffice-core." 3.1. 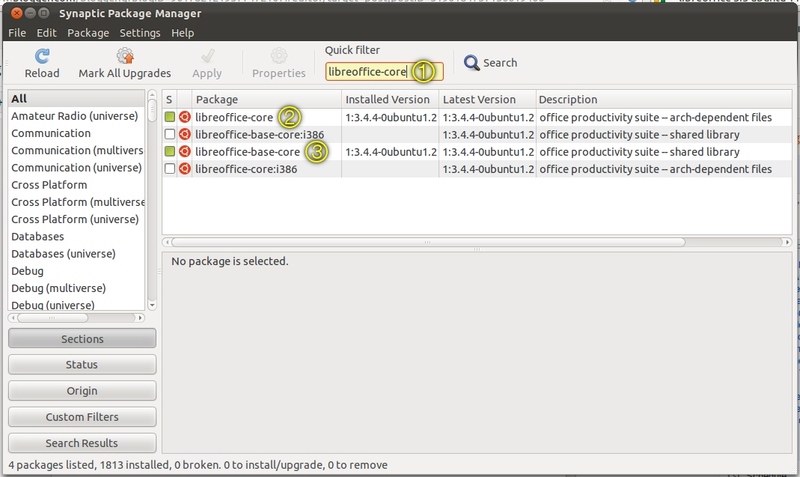 Click the green box in the left-most column of the libreoffice-core package. See Pic 4. In the menu, select Mark for Complete Removal. Pic 4 - Refer to Step 3.1. Marking the packages for complete removal. 3.2. A nameless window will appear. In the window, click the Mark button. See Pic 5. Pic 5 - Refer to Step 3.2. Marking the packages that needs to be removed. 3.3. Then click the Apply button in the Synaptic Package Manager window. See Pic 6. Pic 6 - Refer to Step 3.3. Applying the changes in the Synaptic Package Manager window. 3.4. The Summary window will appear. In the window, click the Apply button. See Pic 7. Allow some time for the removal process to complete. 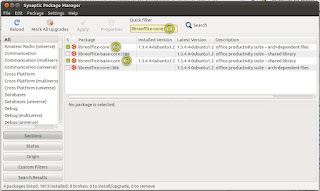 The Synaptic Package Manager window can be closed after the removal process is complete. Pic 7 - Refer to Step 3.4. Applying the changes in the Summary window. 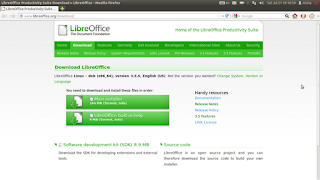 The latest version as of 21st July 2012 is LibreOffice 3.5.5. 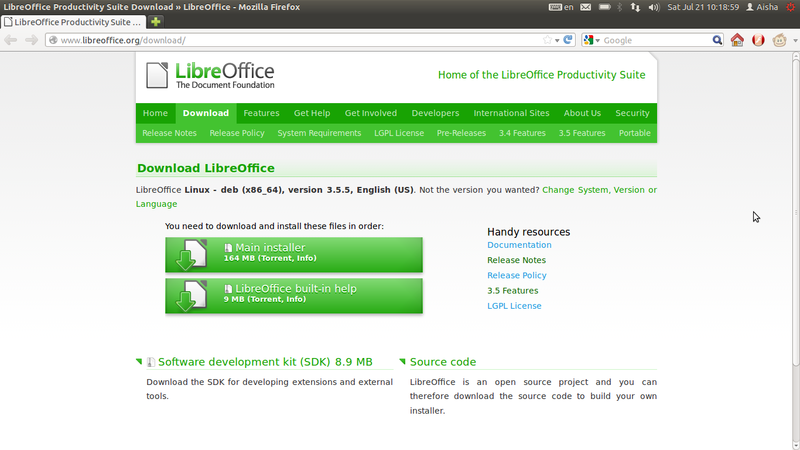 Pic 8 - Downloading LibreOffice 3.5.5 from the LibreOffice website. I chose the torrent link. 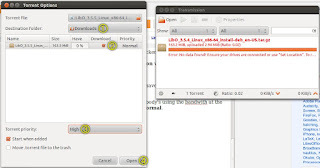 The Opening LibO ### window will appear to download the tracker. Click the OK button. See Pic 9. Pic 9 - Refer to Step 4. Saving the tracker file. 5. In the Downloads window, double-click the tracker. See Pic 10. 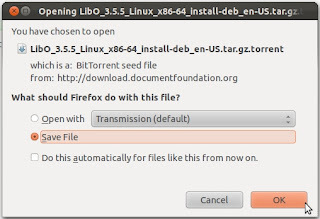 The Torrent Options window and Transmission window will appear. See Pic 11. Pic 10 - Refer to Step 5. Launching the tracker. give the Destination folder a location to save the tracker. I saved it to the Downloads folder. put a tick in the box under the Download column. i set the Torrent priority to High because i'm the only one consuming the bandwith at the moment ^__^. Otherwise just leave it at Normal. Then click the Open button. The Torrent Options window will disappear. Leave the download to complete. A Torrent Complete notification, see Pic 12, will appear at the upper right-hand corner to inform. The Transmission window can then be closed. Pic 11 - Refer to Step 6. Setting the download properties. Pic 12 - Refer to Step 6. The Torrent Complete notification. In the first install, i followed all the steps in Part C which caused the LibreOffice icons in the Launcher to be invisible! You can't see it but you can click it. Its icon was invisible in the Launcher. See Pic 13. The system was a little laggy but then again it might just be me. The system froze, only the mouse was working. Alt+F2 didn't work. Ctrl+Alt+Del didn't work. This called for a forced restart. The system froze probably because i didn't restart the system as was requested to after an update. Instead, i proceeded with upgrading LibreOffice. Pic 13 - Invisible Writer icon in Launcher. To try solve the problem, i ran Synaptic Package Manager to remove all the LibreOffice 3.5 packages. The steps are similar to Part A except for the search term libreoffice3.5. 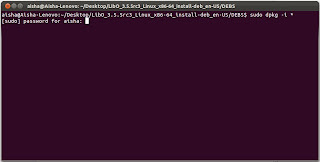 To install LibreOffice 3.5.5 again, i followed all the steps in Part C except for Step 11. This time its icon was visible in the Launcher. Then i ran Calc again. Its icon is a few seconds slow to appear but it still appeared. Pic 14 - Blurry LibreOffice icons in Launcher. 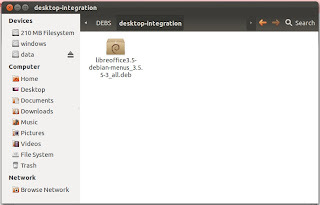 Read more about the desktop-integration problem to look for a better solution. Or, follow the Second install round then check to see for any problems. If there are problems, only then try to install the file inside the desktop-integration folder. 7. 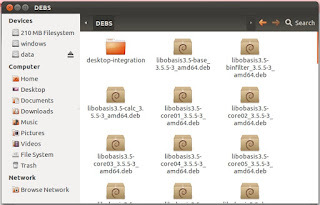 In the Downloads folder, double click the LibO_3.5.5_Linux_x86-64_install-deb_en-US.tar.gz file. See Pic 15. Pic 15 - Refer to Step 7. 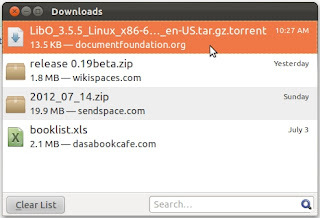 The downloaded zip file. 8. In the LibO ### window, click the Extract button. See Pic 16. In the Extract window, give the folder a location for it to be extracted to then click the Extract button. See Pic 17. I put it on the Desktop. Pic 16 - Refer to Step 8. Pic 17 - Refer to Step 8. Extracting the folder. 9. On the Desktop, open the extracted folder. Pic 18 - Refer to Step 9. Contents of the extracted folder. 10. Open the DEBS folder. Pic 19 - Refer to Step 10. Contents of the DEBS folder. 11. 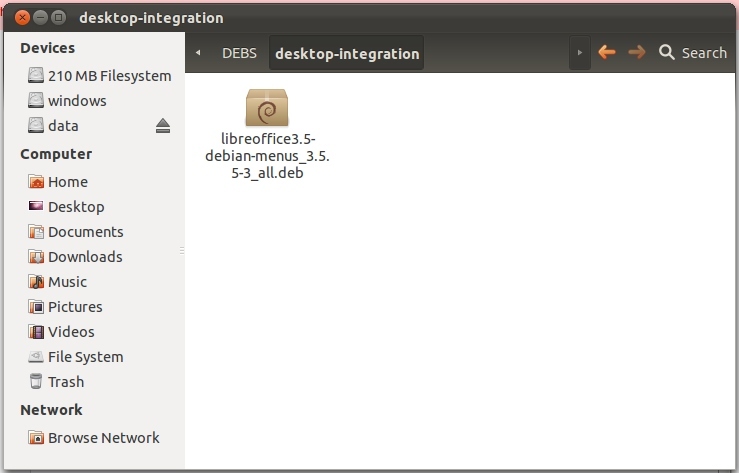 Open the desktop-integration folder. Cut-and-paste this file into the DEBS folder. Pic 20 - Refer to Step 11. 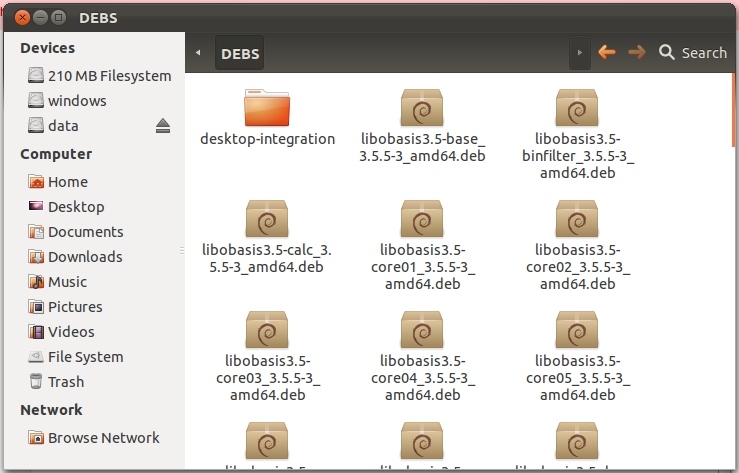 Content of the desktop-integration folder. 12. In the DEBS folder, right-click anywhere inside the folder. See Pic 21. In the right-click menu, select the Open in Terminal shortcut. The Terminal will appear with the directory of the folder. See Pic 22. Pic 21 - Refer to Step 12. Accessing the Terminal through its shortcut in the right-click menu. Key-in your password then press the Enter button to proceed. Give the process some time to install. 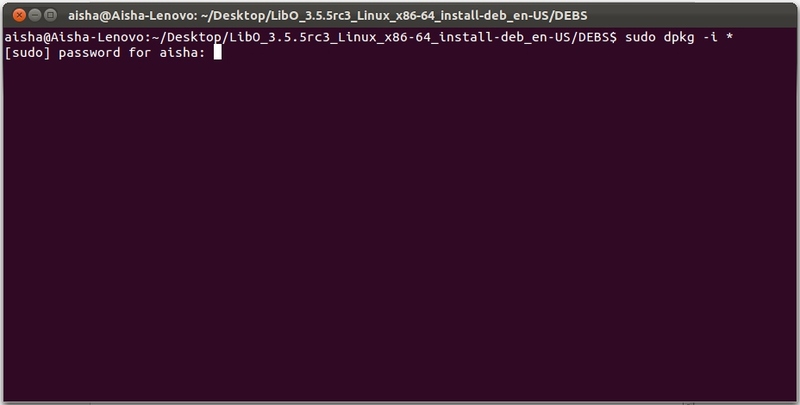 The Terminal can be closed when the install is complete. Pic 22 - Refer to Step 13. 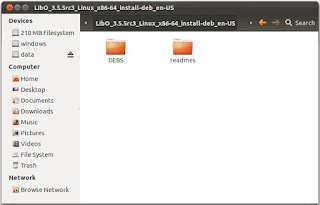 Batch installing the *.deb files of LibreOffice 3.5.5. 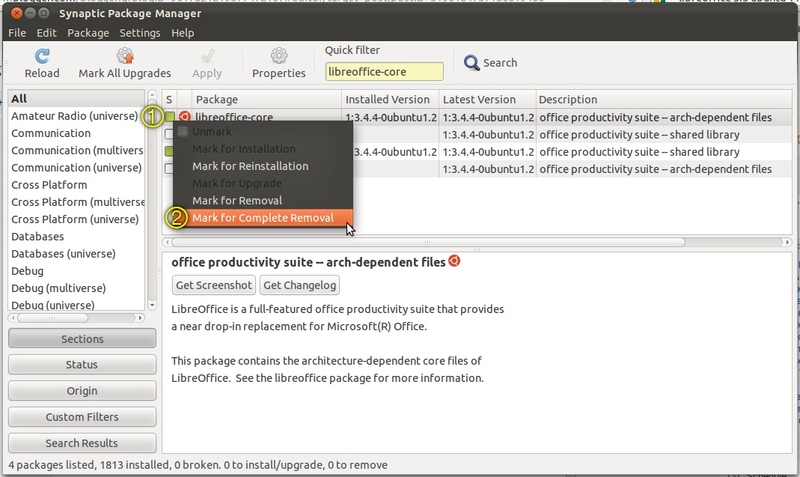 Go give LibreOffice 3.5 a try.